We demonstrate that chimera behavior can be observed in nonlocally coupled networks of excitable systems in the presence of noise. 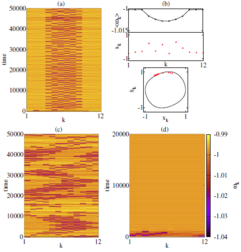 This phenomenon is distinct from classical chimeras, which occur in deterministic oscillatory systems, and it combines temporal features of coherence resonance, i.e., the constructive role of noise, and spatial properties of chimera states, i.e., coexistence of spatially coherent and incoherent domains in a network of identical elements. Coherence-resonance chimeras are associated with alternating switching of the location of coherent and incoherent domains, which might be relevant in neuronal networks. We propose a control scheme which can stabilize and fix the position of chimera states in small networks. Chimeras consist of coexisting domains of spatially coherent and incoherent dynamics in systems of nonlocally coupled identical oscillators. 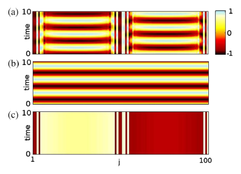 Chimera states are generally difficult to observe in small networks due to their short lifetime and erratic drifting of the spatial position of the incoherent domain. The control scheme, like a tweezer, might be useful in experiments, where usually only small networks can be realized. 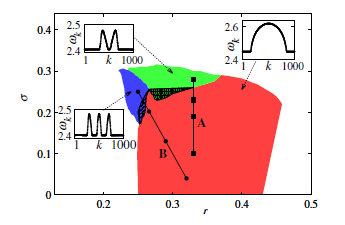 For a network of generic oscillators with nonlocal topology and symmetry breaking coupling we establish novel partially coherent inhomogeneous spatial patterns, which combine the features of chimera states (coexisting incongruous coherent and incoherent domains) and oscillation death (oscillation suppression), which we call “chimera death”. We show that due to the interplay of nonlocality and breaking of rotational symmetry by the coupling, two distinct scenarios from oscillatory behavior to a stationary state regime are possible: a transition from an amplitude chimera to chimera death via in-phase synchronized oscillations and a direct abrupt transition for larger coupling strength. Systems of nonlocally coupled oscillators can exhibit complex spatiotemporal patterns, called chimera states, which consist of coexisting domains of spatially coherent (synchronized) and incoherent dynamics. We report on a novel form of these states, found in a widely used model of a limit-cycle oscillator if one goes beyond the limit of weak coupling typical for phase oscillators. Then patches of synchronized dynamics appear within the incoherent domain giving rise to a multi-chimera state. 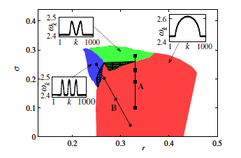 We find that, depending on the coupling strength and range, different multichimera states arise in a transition from classical chimera states. 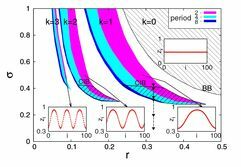 The additional spatial modulation is due to strong coupling interaction and thus cannot be observed in simple phase-oscillator models. 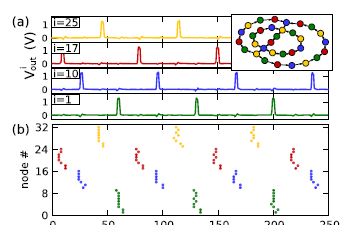 We study experimentally the synchronization patterns in time-delayed directed Boolean networks of excitable systems. We observe a transition in the network dynamics when the refractory time of the individual systems is adjusted. When the refractory time is on the same order of magnitude as the mean link time delays or the heterogeneities of the link time delays, cluster synchronization patterns change, or are suppressed entirely, respectively. We also show that these transitions occur when we change the properties of only a small number of driver nodes identified by their larger in degree; hence, the synchronization patterns can be controlled locally by these nodes. Our findings have implications for synchronization in biological neural networks. Networks of nonlocally coupled phase oscillators can support chimera states in which identical oscillators evolve into distinct groups that exhibit coexisting synchronous and incoherent behaviors despite homogeneous coupling. 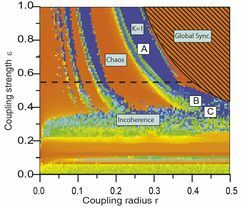 Similar nonlocal coupling topologies implemented in networks of chaotic iterated maps also yield dynamical states displaying coexisting spatial domains of coherence and incoherence. In these discrete-time systems, the phase is not a continuous variable, so these states are generalized chimeras with respect to a broader notion of incoherence. Chimeras continue to be the subject of intense theoretical investigation, but have yet to be realized experimentally. Here we show that these chimeras can be realized in experiments using a liquid crystal spatial light modulator to achieve optical nonlinearity in a spatially extended iterated map system. We study the coherence-incoherence transition that gives rise to these chimera states through experiment, theory, and simulation. The International Conference on Delayed Complex Systems held from 4 to 8 June 2012 at the Institute for Cross-Disciplinary Physics and Complex Systems (IFISC) in Palma de Mallorca, Spain, and co-organized with the Collaborative Research Center SFB 910 Control of Self-Organizing Nonlinear Systems—Theoretical Methods and Concepts of Application, Berlin, provided a forum for such topics. We took that opportunity to assemble a list of world leading experts, which now enables us to present perspectives of the state of the art in this field. This Theme Issue covers both applications and experiments, as well as mathematical foundations. The individual contributions summarize recent research results, but also address the broader context. Thus, the presentation is kept accessible for a large audience. The 14 articles cover various aspects of delay dynamics, control and information, ranging from fundamental mathematical aspects via delayed networks and time-delayed feedback control, to applications in neural science, optoelectronics and genetic control in cells. The articles are grouped into four parts. We discuss the breakdown of spatial coherence in networks of coupled oscillators with nonlocal interaction. 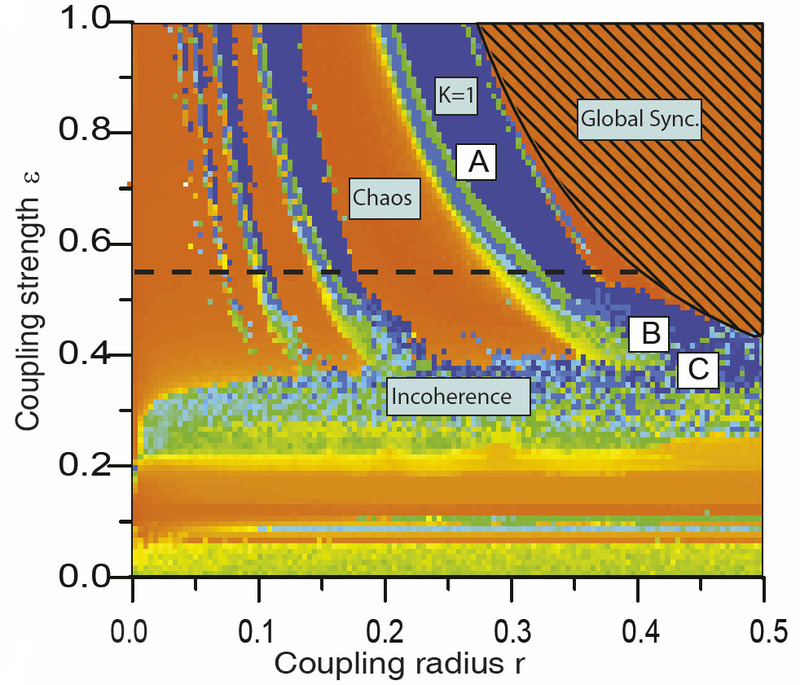 By systematically analyzing the dependence of the spatiotemporal dynamics on the range and strength of coupling, we uncover a dynamical bifurcation scenario for the coherence-incoherence transition which starts with the appearance of narrow layers of incoherence occupying eventually the whole space. Our findings for coupled chaotic and periodic maps as well as for time-continuous Rossler systems reveal that intermediate, partially coherent states represent characteristic spatiotemporal patterns at the transition from coherence to incoherence.